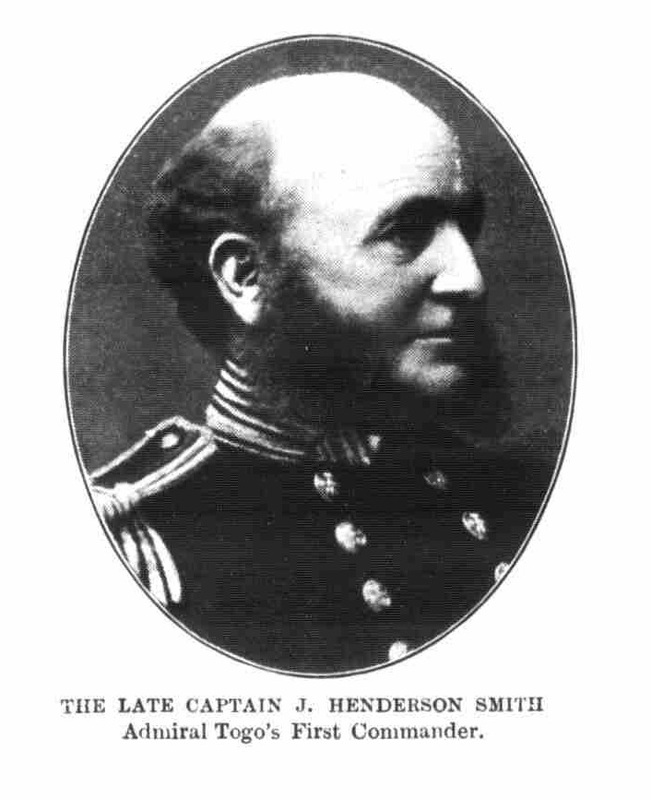 Captain John Henderson Smith was born, according to his gravestone, on 27 December 1826 and was married to Jessie. 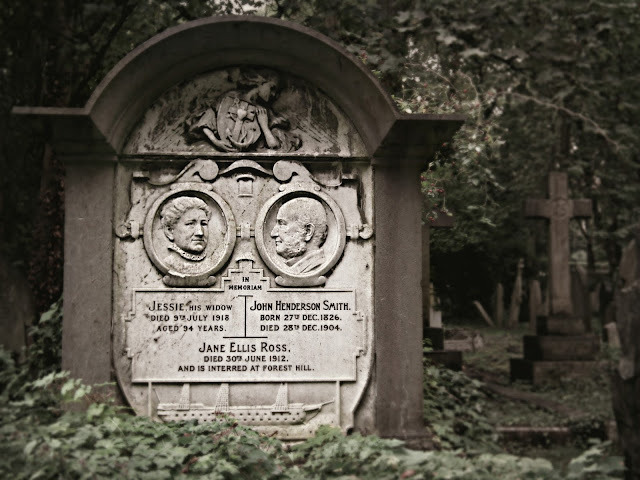 The brief obituaries that appeared in the papers after his death in 1904 contain the intriguing information that he was “Younger Brother of Trinity House, commander of H.M.S. Worcester (Thames Nautical Training College) for 25 years, from which position retired 1892, has died Folkestone, the age 78. It was during Captain Smith's command of the Worcester that Admiral Togo received his early training on board that ship.” H.M.S. Worcester was the training ship of the Mercantile Marine School and was generally moored at Greenhithe in Kent and cadets run through their paces sailing in the busy traffic of the Thames estuary though occasionally it took its pupils out to sea. 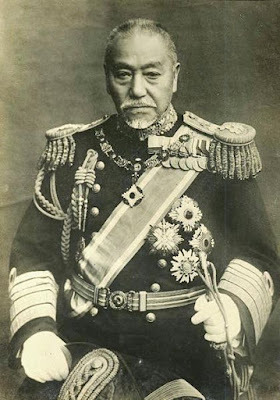 Admiral Tōgō Heihachirō Saneyoshi was Henderson Smith’s greatest pupil. Known as the Nelson of the East, Tōgō’s most famous victory was at the Battle of Tsushma in 1905 when the Japanese navy shocked the world (and some of its own commanders) by destroying the Russian Baltic fleet. The defeat prompted the 1905 naval uprisings in Vladivostok and the Black Sea (where the crew of the battleship Potemkin mutinied) and therefore Tōgō, and indirectly his mentor Henderson Smith, played a not insignificant part in formenting the Russian Revolution. The Admiral’s strategic skill and iron nerves were famed; a legendary story about him has his second in command at the battle of Tsushma uncontrollably nervous about the outcome of the battle with the supposedly superior Russian navy. The 57 year old admiral invited the vice-admiral to insinuate his hand into the admiral’s rather loose fitting trousers and gently take hold of his testicles. Astonished at the order he may have been but the vice admiral instantly obeyed. His nerves were immediately calmed to feel his superior’s balls still hanging loose in the scrotal sac and therefore betraying not the slightest hint of anxiety about the progress of the battle. Tōgō spent three terms on board HMS Worcester in 1873/74. 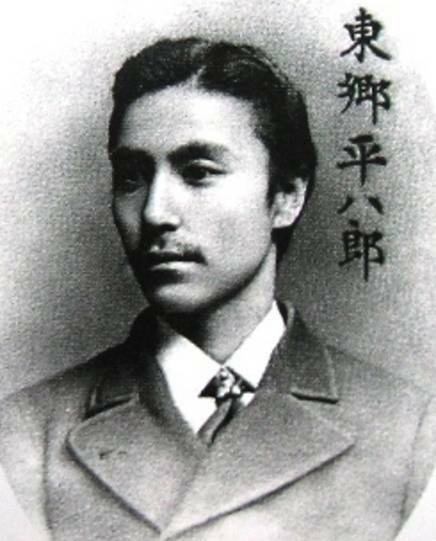 The son of a samurai, Tōgō had come to England in a shabby second hand suit (Japan at that time having no tailors capable of turning out a western suit) as one of a contingent of 12 naval cadets in 1871. He spent his first months studying mathematics at Cambridge and improving his English. He was keen to enrol at the Royal Naval College at Dartmouth but his age, 25, effectively barred him as he was considered too old. Instead he took and passed the entrance exam for the Thames Marine Officer Training School on HMS Worcester. The trainee officers of the Merchant Marine were not especially welcoming to a foreigner and called Tōgō Johnny Chinaman to his face. According to the Rev. Capel, his Cambridge Mathematics tutor, “the young samurai did not like that, and on more than one occasion he put an end to it by blows." He also found the diet and the size of his rations “I swallowed my small rations in a moment. I formed the habit of dipping my bread in my tea and eating a great deal of it, to the surprise of my English comrades." Perhaps to the astonishment of his colleagues he graduated second in class. Henderson Smith would probably have been less surprised; he took a keen interest in the young sailor and Tōgō reciprocated, remembering his former master with esteem for the rest of his life.